Abstracts for this year's Lunar and Planetary Sciences Conference are now online. The final announcement for attendees has also been published. This year's conference has been moved from South Shore Harbor Resort north to The Woodlands Waterway Marriott Hotel north of Houston, Texas. This year's conference has also been moved to one week later than usual, the week after spring break for many universities. 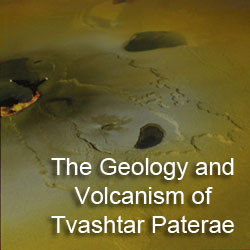 The conference is scheduled for March 23-27, 2009. Several Io-related abstracts have been submitted for the conference. All but one, that I have found so far, will be presented during the poster session on the evening of Tuesday, March 24. Below is a listing of the Io-related abstracts I have found so far, and links to them. Over the next few days, I will post discussions of each abstract here on the blog. Volcanism on Io: Insights from Global Geologic Mapping by Dave Williams et al. The blog post covering this abstract is located here. Geologic Mapping of the Hi'iaka and Shamshu Regions of Io by Bunte et al. The blog post covering this abstract is located here. Classification of Io's Paterae: Active vs Inactive by Barth, Radebaugh, and Christiansen. The blog post covering this abstract is located here. Ionian Volcanoes Reveal Their Temperatures by Allen and Radebaugh. The blog post covering this abstract is located here. Optimal Wavelengths for Studying Thermal Emission from Active Volcanoes on Io by Keszthelyi, Davies, and McEwen. The blog post covering this abstract is located here. 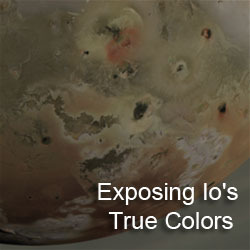 Ground-Based Observations of Io in Support of the New Horizons Flyby by Rathbun and Spencer. The blog post covering this abstract is located here. Argus: A New Frontiers mission to observe Io by Borer et al. The blog post covering this abstract is located here. DSMC Modeling of 3D Vent Geometries for Ionian Plumes by McDoniel et al. The blog post covering this abstract is located here. 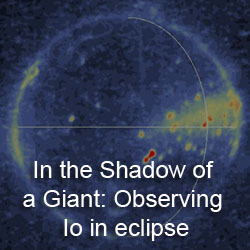 Io Volcano Observer (IVO) by McEwen et al. The blog post covering this abstract is located here.